Little Mosquito is a new funny point and click game about being an annoying insect from gamesfree. This is your time to scour the skies as a little blood feeding mosquito hunting human and avoiding their death slap while you feed on their blood. As you go further, you will have the chance to upgrade your different skills enabling you to become faster, better and stronger. There are 4 levels in the game but you must beat them accordingly to unlock them. 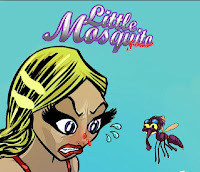 Moving on to Little Mosquito walkthrough here is a list of codes and a video. Type the following Little Mosquito cheats codes into the cheat field: Jumbo - bigger you; MINIME - tiny you; ARMORALL - you can crash anywhere; BLOODYMARY - added 300 drops to your account; HALFTIME - start with half energy; RAMBO - unlock all upgrades.